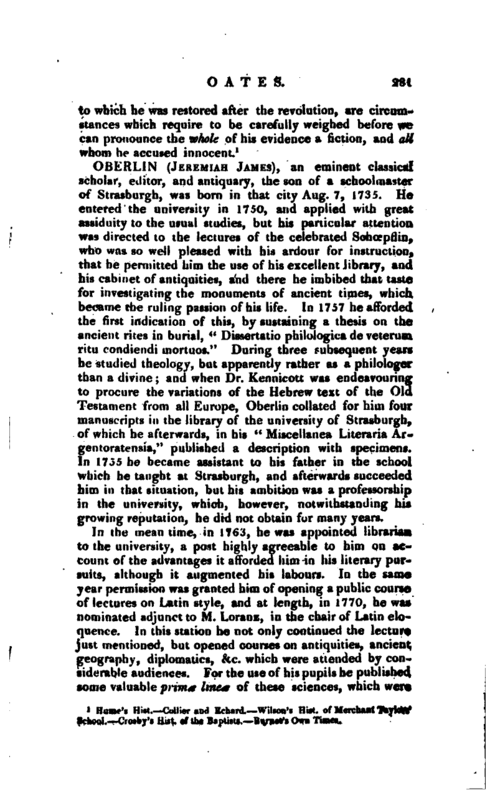 , an eminent classical scholar, editor, and antiquary, the son of a schoolmaster of Strasburgh, was born in that city Aug. 7, 1735. 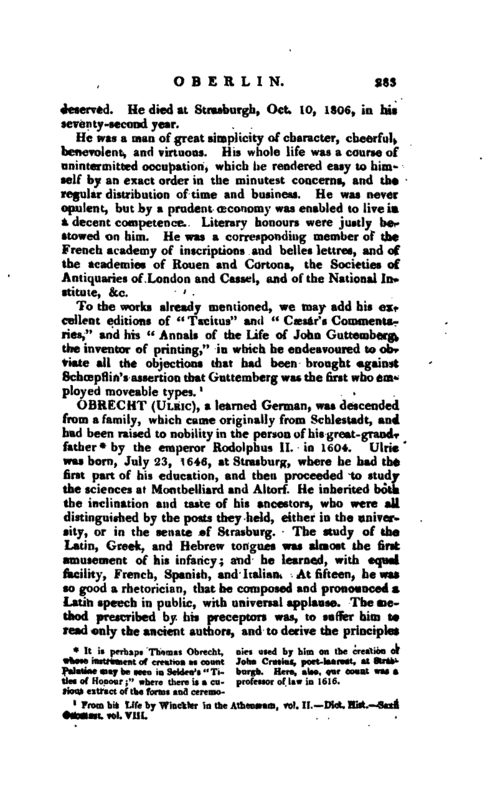 He entered the university in 1750, and applied with great assiduity to the usual studies, but his particular attention was directed to the lectures of the celebrated Schcepflin, who was so well pleased with his ardour for instruction, that he permitted him the use of his excellent library, and his cabinet of antiquities, and there he imbibed that taste for investigating the monuments of ancient times, which, became the ruling passion of his life. In 1757 he afforded the first indication of this, by sustaining a thesis on the ancient rites in burial, “Dissertatio philologica de veterum ritu condiendi inortuos.” During three subsequent years he studied theology, but apparently rather as a philologer than a divine; and when Dr. Kennicott was endeavouring to procure the variations of the ‘Hebrew text of the Old Testament from all Europe, Oberlin collated for him four manuscripts in the library of the university of Strasburgh, of which he afterwards, in his “Miscellanea Literaria Argentoratensia,” published a description with specimens. In 1755 he became assistant to his father in the school which he taught at Strasburgh, and afterwards succeeded him in that situation, but his ambition was a professorship in the university, which, however, notwithstanding his growing reputation, he did not obtain for many years. In the mean time, in 1763, he was appointed librarian to the university, a post highly agreeable to him on account of the advantages it afforded him in his literary pursuits, although it augmented his labours. In the same year permission was granted him of opening a public course of lectures on Latin style, and at length, in 1770, he was nominated adjunct to M. Loranz, in the chair of Latin eloquence. In this station he not only continued the lecture just mentioned, but opened courses on antiquities, ancient geography, diplomatics, &c. which were attended by considerable audiences. For the use of his pupils he published some valuable prim* linete of these sciences, which were | adopted, for their great utility, in other universities. Among these we may notice his “Rituum Romanorum tabular,” “Orbis antiqui, monumentis suis illustrati, primae lineae” “Artis diplomaticæ primæ lineæ” “Literarum omnis ævi fata,” &c.
Among the dissertations which the duties of his professorship required, were four curious ones, containing a historical view of the attempts made in all ages to unite seas and rivers by means of canals. These were published collectively in 1775, under the title of “Jungendorum marium fluminumque omnis sevi molimina.” Another of his printed dissertations, printed in 1773, had for its subject “De Latinos linguae medii a3vi mira barbaric.” Others appeared in the “Miscellanea Argentoratensia,” which he conducted from 1770 to 1773, particularly a treatise on the value of money among the ancient Romans, in which he entered into a rigorous examination of Eisenschmid’s calculations of the coins, weights, and measures of antiquity. During a visit to his brother in the mountains of Lorrain, he amused himself with studying the patois of the natives, and in an “Essai stir le Patois Lorrain,” &c. 1776, 12mo, showed its derivation from the language of the ancient Romans, and its relation to the other patois, and to the old French. In 1778 he obtained a release from the labours of his father’s school, by being appointed professor extraordinary in the university, with a salary which indemnified him for the loss of his other place; and in March 1782, he succeeded to the chair of logic and metaphysics, which office he retained as long as the old university existed. To his publications he added between these years, an edition of “Vibius Sequester de fluminibus, fontibus,” &c. 1778, 8vo; an edition of Ovid’s “Tristia;” “Glossarium Germanicum medii aevi, potissimum dialecti Suevicae,” 1781—1784, 2 vols. fol. 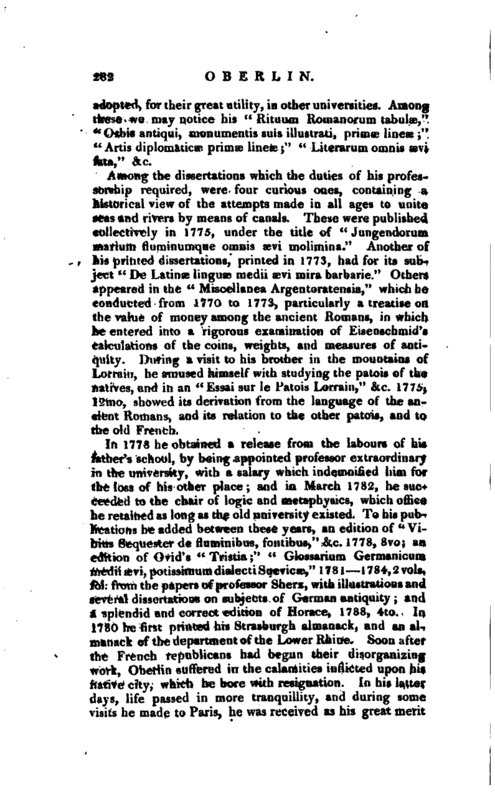 from the papers of professor Sherz, with illustrations and several dissertations on subjects of German antiquity; and a splendid and correct edition of Horace, 1788, 4to. In 1780 he first printed his Strasburgh almanack, and an almanack of the department of the Lower Rhine. Soon after the French republicans had begun their disorganizing work, Oberlin suffered in the calamities inflicted upon his native city, which he bore with resignation. In his latter days, life passed in more tranquillity, and during some visits he made to Paris, he was received as his great merit | deserved. He died at Strasburgh, Oct. 10, 1806, in his seventy-second year. He was a man of great simplicity of character, cheerful, benevolent, and virtuous. His whole life was- a course of unintermitted occupation, which he rendered easy to himself by an exact order in the minutest concerns, and the regular distribution of time and business. He was never opulent, but, by a prudent ceconomy was enabled to live in a decent competence. Literary honours were justly bestowed on him. He was a corresponding member of the French academy of inscriptions and belles lettres, and of the academies of Rouen and Cortona,’ the Societies of Antiquaries of London and Cassei, and of the National Institute, &c.
From his Life by Winckler in the Athenæum, vol. II.—Dict. Hist.—Saxii Onomast. vol. VIII.